My athletic endeavors are a relatively new thing within the past 5-6 years. I was a chunky, sedentary kid that always tried to get out of the mile during gym class. I joined the track and field team in 8th grade to hang out with my friends and was a (not very good) “sprinter” my freshman and sophomore year of HS. I took a hiatus until my senior year of college in Boston at Northeastern University. I started running to deal with my anxiety and the pesky freshman 15 (and then some) that stuck around throughout college. While watching the Boston Marathon in April 2012 on Boylston Street with a friend, I became inspired to start participating in races. Now five years later I’ve done a lot of 5ks, two 10ks, 8+ half marathons, four marathons, and just did my first Sprint Triathlon last Sunday. In 2014, I cheered on my boyfriend’s (now husband) cousin at the Boston Marathon while she ran for charity. In 2015, I signed on with her charity to run the Boston Marathon. It was a really, really rough winter for training with record snow fall and cold. I joined a running club and did the long runs for 20 weeks leading up to the big day. Unfortunately after my last 20 mile long run and running too much mileage, tendonitis developed in my right foot which was not fun. The day of the marathon was cold and raining, but I was pumped to run the race. The hills were tough but the crowds were still out even in the poor weather. I ended up crossing the finish line even after ending up briefly working with EMTS for hypothermia and some other issues. Then I celebrated with my mom, who flew up from Alabama, my boyfriend and his family. 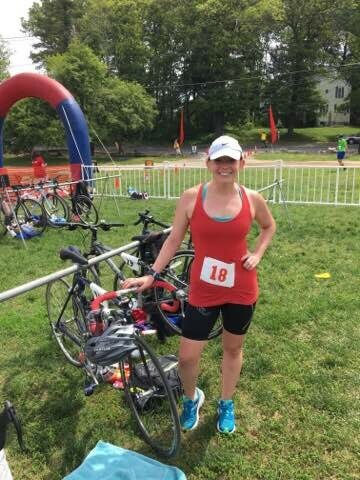 After doing four marathons, I was looking for a change and decided to try triathlons. I swam for a few years as a kid and love spin classes as cross training. How hard can it be, right? It’s a totally different balancing act than just training for a running race but I’m loving the change in schedule. My transformative event will be the Cranberry Trifest Olympic Triathlon in August. My experience as an athlete has made me a more confident person in the workplace. Also, working out on a regular basis and keeping myself challenged genuinely makes me happy. I’m a big University of Alabama football fan – Roll Tide.